An Occupational Health and Safety (OH&S) Management System provides a framework for an organisation to identify and control its health and safety risks, reduce the potential for accidents, comply with legislation and improve operational performance. OHSAS 18001 is the requirement standard for an OH&S Management Systems which was updated and adopted as OHSAS 18001:2007. (Note: This is due to be replaced in 2016 by ISO 45001). The update reflects the learnings achieved from widespread use of the standard across the world and provides more emphasis on "Health" rather than just "Safety". The specification has been designed to be compatible with the ISO 9001 and ISO 14001 management system standards. OHSAS 18001 requires an organisation to formally document the areas that are covered by their OH&S policy and to keep evidence that it is operating according to the requirements of the standard. It is relevant to any organisation that wants to conform to legislation and demonstrate to staff and stakeholders that it has systems in place to minimise and eliminate risks. It ensures that an organisation has the measures and controls to manage the risks associated with their activities. It will also demonstrate its commitment to stakeholders, improve operational performance through better accident management and reduced downtime with a corresponding reduction in insurance premiums and penalties for breach of legislation. 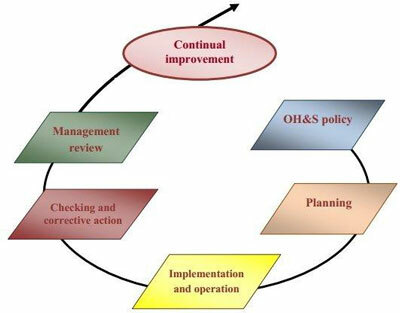 Briefly, it's similar in structure to ISO 14001, it requires you to identify potential hazards, assess the level of risk associated with these hazards and determine the necessary controls to manage the risk. As with ISO 14001, you will develop health & safety objectives. These will invariably be derived from results of your risk assessments. Having identified your objectives, you will develop targets & programmes to achieve them. Through careful planning, you would implement appropriate processes and adopt suitable working practices to help you achieve these targets. You would provide the necessary training & awareness to ensure all activities are conducted in a safe manner without the potential to harm. You then monitor how well things go and take corrective actions whenever things don't go to plan. In addition you would develop a series of emergency response plans to deal with emergency situations. As with all management systems, you will then review the system on a regular basis to ensure it remains effective.